China and Russia’s joint anti-terrorism exercise dubbed “Peace Mission-2013” has entered its final stage, simulated combat, according to a Chinese military officer. “In the last phase, we will organise field manoeuvres using live fire,” said Ma Jixiang, Chinese Assistant Director of the drill and Deputy Director of the Combat Department of the Shenyang Military Area Command Headquarters. The drills are taking place at the Chebarkul combined training range in the Ural Mountains in Russia, and will run till August 15. Troop deployment in counter-terrorist operations, battle planning, coordinating campaign attempts and formulating combat plans were simulated during the joint exercises. 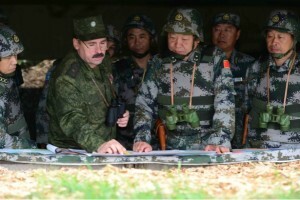 Russia and Chinese troops have practised joint reconnaissance, joint block and control of accident areas, joint support for campaign equipment and live-ammunition exercises, said Ma. Meanwhile, Chinese State Councillor Yang Jiechi will visit Russia later this week to attend a new round of strategic security consultations between the two countries. China has stated that the drills are not targeted towards any nation, and has criticised media reports that the drills were a counter to US-Japan joint exercises conducted around the same time. According to China Military Online, the Japan-US joint military drill site was less than 800 km from the waters where the last China-Russia military exercise was held. China is locked in territorial disputes with traditional US allies, Philippines and Japan in the South China Sea. The US has recently announced an increase in its annual military assistance to the Philippines from $30 million to about $50 million.